This book is a fantastic young adult intro to writers like Terry Pratchett. The whole book pokes ridiculous fun at fantasy tropes all the meanwhile creating a fantastic world with memorable characters. Princess Cimorene is another female lead who was ahead of her time, sarcastic, rebellious and practical. Don’t Mess with Cimorene #1: The whole story starts off by explaining this princess (Cimorene) who looked and acted different than all the other princesses thought she should. Her family pushes through regardless, determined to do what is proper and arranges a marriage with a moronic prince named Therandil. A talking frog gives her the idea to become a dragon’s princess however and thus starts the story rolling. Cimorene is told what is proper, promptly ignores it and signs up to be a dragon’s princess by marching up to the dragons and offering her services, cherries jubilee included. Don’t Mess with Cimorene #2: There are many other moments that show her ingenuity throughout the story while she deals with pesky wizards as well as princes and knights determined to rescue her, but one of the highlights of this book had to be the encounter with the djinn. Therandil, ever determined to do what is proper and save her, despite the fact that she doesn’t want to be saved, ends up opening a djinn’s bottle while she’s trying to clean. The djinn tells them they must die, but can choose the manner of their death. Cimorene chooses old age and the djinn gets flustered because its not proper. He’s prepared to kill them anyway when Cimorene catches his slip that he wasn’t quite in there the proper amount of time to kill them, but ‘no one ever releases the djinn before the three hundred years.’ Cimorene’s solution? Go back in the bottle another hundred years and they’ll be dead by then, getting her wish for a death by old age anyway. Don’t Mess with Cimorene #3: First the wizards kill the dragon King. Then they try to sabotage the race to choose a new one. Neither of these things sits well with Cimorene and to her luck, her and the Princess Alianora discovered a way to melt them: soapy lemon water. So with the help of the kooky witch Morwen, a stone prince and Princess Alianora, Cimorene takes the wizards on, one soapy bucket of water at a time. They stop them at the Ford of Whispering Snakes just before their plan could be pulled off and melt them all. 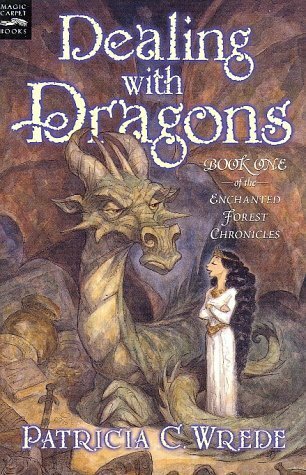 When it turns out Kazul, Cimorene’s dragon, becomes the King of the Dragons, everything ends quite happily with Cimorene becoming the King’s Librarian and Cook rather than the monotonous life of marrying a bore and becoming queen to a dullard like Therandil. Even though it ended on the happy ending trope of a fairy tale, Patricia Wrede does a brilliant job at keeping things fresh. Cimorene doesn’t end up married away at the end of this book, rather she finds work and stays the same independent, fiesty woman we love. If you haven’t read these books yet, check it out on Goodreads!